Some parties need “go anywhere” glassware. 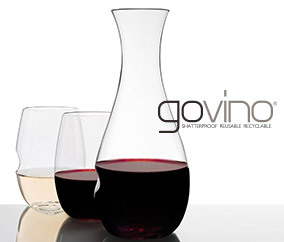 Impossibly thin and designed for the ultimate enjoyment of all things wine and cocktail, govino performs like fine crystal, but is flexible, shatterproof, and BPA-free, making it ideal for those special occasions on-the-go. T+L Family Club members get free shipping on a Decanter and Wine Glass Set! Set contains one 28 oz Decanter and two 16 oz Wine Glasses.